Service, value, and convenience all in Oak Harbor on Whidbey Island. For more than 35 years our friendly, professionally trained staff has been providing Whidbey Island residents, visitors and businesses with a full range of personal and business services and products. We offer customers more shipping options than anyplace in Oak Harbor. We are locally owned, not a franchise. We are a US Postal Service Approved Shipper, UPS Authorized Shipping Outlet, DHL Authorized Shipping Center, and a FedEx Authorized ShipCenter. All of these companies have awarded us this status based on our consistent commitment to outstanding customer service. So please come in and see why we are the best choice for all of your service needs. 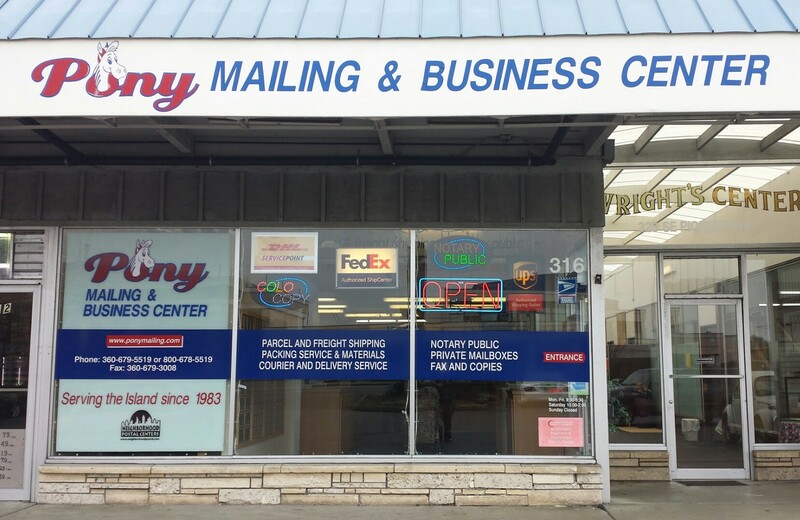 Pony Mailing & Business Center is dedicated to providing you with superior service. **Note** We will be closed on Saturday, April 27th, for Holland Happening. Mail will still be put away for our boxholders.